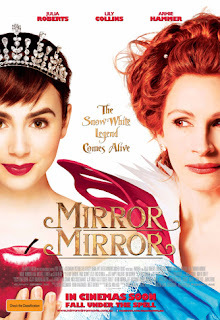 I'd been anticipating this movie ever since I'd seen the previews before it hit theaters - maybe because it seemed like a more positive alternative to that dark Snow White movie starring the gross Twilight girl. The jokes were funny and really, who doesn't love a movie with midgets? Oh sorry, I mean little people. I mean, does anyone remember how much better Austin Powers got when Mini Me joined the cast? Now, I realize this is a family movie. As was another movie I recently watched... and skewered. But why should my standards for a family movie be any lower than a regular movie? Is it unfair to call a movie sucky just because it targets young kids? I mean, there's a reason Walt Disney (and Co.) has won so many Oscars - because Disney movies are mostly awesome (I don't care how well it did at the box office or that it managed a sequel, Cars was really stupid and annoying). This is the standard to which every other "family movie" is compared, in my world. And this one failed. Miserably. Especially when I think back to a comparable Disney movie - Enchanted. A bright spot in the movie was actually Julia Roberts. I understand she's actually the star, and the main draw for people, but in general, I don't like her. I find her... abrasive. And in this movie, she plays an ok villain (she really should have watched Enchanted and taken some notes from Susan Sarandon). What's great about her in this movie is how she looks. It's incredible, really, how flawless they make her face look. It's no wonder actors in Hollywood are obsessed with plastic surgery - who can look like that in everyday life? So it's sort of humorous that we are supposed to believe that Lily Collins with her furry eyebrows is supposed to be more beautiful. But who knows - they are legions of people out there who adore Frida Kahlo. Final word: I only like my pizzas cheesy, not my movies (yes, this was intentionally corny to reflect the nature of the movie). Looking for something to watch?